Unfortunately, due to sales rights restrictions, we cannot offer The Highway War for sale in your country. 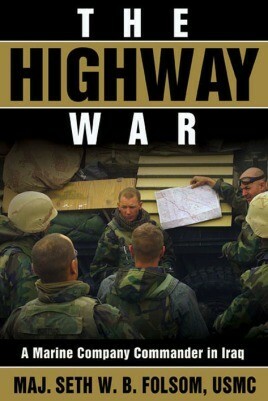 The Highway War is the compelling Iraq War memoir of then-Capt. Seth Folsom, commanding officer of Delta Company, First Light Armored Reconnaissance Battalion, U.S. Marine Corps. Mounted in eight-wheeled LAVs (light armored vehicles), this unit of 130 Marines and sailors was one of the first into Iraq in March 2003. It fought on the front lines for the war’s entire offensive phase, from the Kuwaiti border through Baghdad to Tikrit. Folsom’s thoughtful account focuses on his maturation as a combat leader—and as a human being enduring the austere conditions of combat and coming to terms with loss of life on both sides. Moreover, The Highway War is the story of a junior officer’s relationships with his company’s young Marines, for whose lives he was responsible, and with his superior officers. Folsom covers numerous unusual military actions and conveys truthfully the pace, stress, excitement, mistakes, and confusion of modern ground warfare. The Highway War is destined to be a Marine Corps classic.